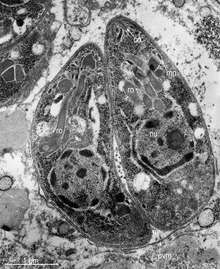 The Apicomplexa (also called Apicomplexia) are a large phylum of parasitic protists. Most of them possess a unique form of organelle that comprises a type of plastid called an apicoplast, and an apical complex structure. The organelle is an adaptation that the apicomplexan applies in penetration of a host cell. The Apicomplexa are unicellular and spore-forming. All species are obligate endoparasites of animals, except Nephromyces, a symbiont in marine animals, originally classified as a chytrid fungus. Motile structures such as flagella or pseudopods are present only in certain gamete stages. The name of the taxon Apicomplexa derives from two Latin words — apex (top) and complexus (infolds) — and refers to a set of organelles in the sporozoite. The Apicomplexa comprise the bulk of what used to be called the Sporozoa, a group of parasitic protozoans, in general without flagella, cilia, or pseudopods. Most of the Apicomplexa are motile, however, by use of a gliding mechanism that uses adhesions and small static myosin motors. The other main lines were the Ascetosporea (now in Rhizaria), the Myxozoa (now known to be derived from animals), and the Microsporidia (now known to be derived from fungi). Sometimes, the name Sporozoa is taken as a synonym for the Apicomplexa, or occasionally as a subset. All members of this phylum have an infectious stage — the sporozoite — which possesses three distinct structures in an apical complex. The apical complex consists of a set of spirally arranged microtubules (the conoid), a secretory body (the rhoptry) and one or more polar rings. Additional slender electron-dense secretory bodies (micronemes) surrounded by one or two polar rings may also be present. This structure gives the phylum its name. A further group of spherical organelles is distributed throughout the cell rather than being localized at the apical complex and are known as the dense granules. These typically have a mean diameter around 0.7 μm. Secretion of the dense-granule content takes place after parasite invasion and localization within the parasitophorous vacuole and persists for several minutes. Flagella are found only in the motile gamete. These are posteriorly directed and vary in number (usually one to three). Basal bodies are present. Although hemosporidians and piroplasmids have normal triplets of microtubules in their basal bodies, coccidians and gregarines have nine singlets. The mitochondria have tubular cristae. A Golgi apparatus is present. Centrioles, chloroplasts, ejectile organelles, and inclusions are absent. Colourless plastids are present in some species. The cell is surrounded by a pellicle of three membrane layers (the alveolar structure) penetrated by micropores. Mitosis is usually closed, with an intranuclear spindle; in some species, it is open at the poles. Cell division is usually by schizogony. Apicomplexans have a unique gliding capability which enables them to cross through tissues and enter and leave their host cells. This gliding ability is made possible by the use of adhesions and small static myosin motors. Other features common to this phylum are a lack of cilia, sexual reproduction, use of micropores for feeding, and the production of oocysts containing sporozoites as the infective form. Most apicomplexans have an apicoplast, (a nonphotosynthetic plastid) and mitochondrial and nuclear genomes, although Cryptosporidium species and gregarines are possible exceptions, as they are thought to have lost their plastids after the diverging last common ancestor of apicomplexans. Within this phylum are three groups — coccidians, gregarines, and haemosporidians. The coccidians and gregarines appear to be relatively closely related. Perkinsus , while once considered a member of the Apicomplexa, has been moved to a new phylum —Perkinsozoa. The gregarines are generally parasites of annelids, arthropods, and mollusks. They are often found in the guts of their hosts, but may invade the other tissues. In the typical gregarine lifecycle, a trophozoite develops within a host cell into a schizont. This then divides into a number of merozoites by schizogony. The merozoites are released by lysing the host cell, which in turn invade other cells. At some point in the apicomplexan lifecycle, gametocytes are formed. These are released by lysis of the host cells, which group together. Each gametocyte forms multiple gametes. The gametes fuse with another to form oocysts. The oocysts leave the host to be taken up by a new host. In general, coccidians are parasites of vertebrates. Like gregarines, they are commonly parasites of the epithelial cells of the gut, but may infect other tissues. The coccidian lifecycle involves merogony, gametogony, and sporogony. While similar to that of the gregarines it differs in zygote formation. Some trophozoites enlarge and become macrogamete, whereas others divide repeatedly to form microgametes (anisogamy). The microgametes are motile and must reach the macrogamete to fertilize it. The fertilized macrogamete forms a zygote that in its turn forms an oocyst that is normally released from the body. Syzygy, when it occurs, involves markedly anisogamous gametes. The lifecycle is typically haploid, with the only diploid stage occurring in the zygote, which is normally short-lived. The main difference between the coccidians and the gregarines is in the gamonts. In the coccidia, these are small, intracellular, and without epimerites or mucrons. In the gregarines, these are large, extracellular, and possess epimerites or mucrons. A second difference between the coccidia and the gregarines also lies in the gamonts. In the coccidians, a single gamont becomes a macrogametocyte, whereas in the gregarines, the gamonts give rise to multiple gametocytes. The Haemosporidia have more complex lifecycles that alternate between an arthropod and a vertebrate host. The trophozoite parasitises erythrocytes or other tissues in the vertebrate host. Microgametes and macrogametes are always found in the blood. The gametes are taken up by the insect vector during a blood meal. The microgametes migrate within the gut of the insect vector and fuse with the macrogametes. The fertilized macrogamete now becomes an ookinete, which penetrates the body of the vector. The ookinete then transforms into an oocyst and divides initially by meiosis and then by mitosis (haplontic lifecycle) to give rise to the sporozoites. The sporozoites escape from the oocyst and migrate within the body of the vector to the salivary glands where they are injected into the new vertebrate host when the insect vector feeds again. Most members have a complex lifecycle, involving both asexual and sexual reproduction. Typically, a host is infected via an active invasion by the parasites (similar to entosis), which divide to produce sporozoites that enter its cells. Eventually, the cells burst, releasing merozoites, which infect new cells. This may occur several times, until gamonts are produced, forming gametes that fuse to create new cysts. Many variations occur on this basic pattern, however, and many Apicomplexa have more than one host. The apical complex includes vesicles called rhoptries and micronemes, which open at the anterior of the cell. These secrete enzymes that allow the parasite to enter other cells. The tip is surrounded by a band of microtubules, called the polar ring, and among the Conoidasida is also a funnel of tubulin proteins called the conoid. Over the rest of the cell, except for a diminished mouth called the micropore, the membrane is supported by vesicles called alveoli, forming a semirigid pellicle. Another similarity is that many apicomplexan cells contain a single plastid, called the apicoplast, surrounded by either three or four membranes. Its functions are thought to include tasks such as lipid and heme biosynthesis, and it appears to be necessary for survival. In general, plastids are considered to have a common origin with the chloroplasts of dinoflagellates, and evidence points to an origin from red algae rather than green. Many of the apicomplexan parasites are important pathogens of human and domestic animals. In contrast to bacterial pathogens, these apicomplexan parasites are eukaryotic and share many metabolic pathways with their animal hosts. This makes therapeutic target development extremely difficult – a drug that harms an apicomplexan parasite is also likely to harm its human host. At present, no effective vaccines are available for most diseases caused by these parasites. Biomedical research on these parasites is challenging because it is often difficult, if not impossible, to maintain live parasite cultures in the laboratory and to genetically manipulate these organisms. In recent years, several of the apicomplexan species have been selected for genome sequencing. The availability of genome sequences provides a new opportunity for scientists to learn more about the evolution and biochemical capacity of these parasites. The predominant source of this genomic information is the EuPathDB  family of websites, which currently provides specialised services for Plasmodium species (PlasmoDB), coccidians (ToxoDB), piroplasms (PiroplasmaDB), and Cryptosporidium species (CryptoDB). One possible target for drugs is the plastid, and in fact existing drugs such as tetracyclines, which are effective against apicomplexans, seem to operate against the plastid. Within the Adelorina are species that infect invertebrates and others that infect vertebrates. The Eimeriorina — the largest suborder in this phylum — the lifecycle involves both sexual and asexual stages. The asexual stages reproduce by schizogony. The male gametocyte produces a large number of gametes and the zygote gives rise to an oocyst, which is the infective stage. The majority are monoxenous (infect one host only), but a few are heteroxenous (lifecycle involves two or more hosts). The number of families in this later suborder is debated, with the number of families being between one and 20 depending on the authority and the number of genera being between 19 and 25. All members of this phylum are parasitic and evolved from a free-living ancestor. This lifestyle is presumed to have evolved at the time of the divergence of dinoﬂagellates and apicomplexans. Further evolution of this phylum has been estimated to have occurred about 800 million years ago. The oldest extant clade is thought to be the archigregarines. Many Coccidiomorpha have an intermediate host, as well as a primary host, and the evolution of hosts proceeded in different ways and at different times in these groups. For some coccidiomorphs, the original host has become the intermediate host, whereas in others it has become the definitive host. 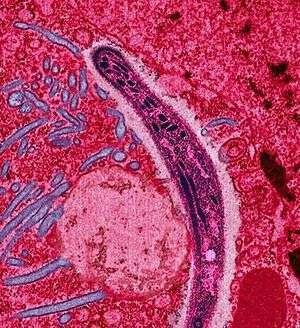 In the genera Aggregata, Atoxoplasma, Cystoisospora, Schellackia, and Toxoplasma, the original is now definitive, whereas in Akiba, Babesiosoma, Babesia, Haemogregarina, Haemoproteus, Hepatozoon, Karyolysus, Leucocytozoon, Plasmodium, Sarcocystis, and Theileria, the original hosts are now intermediate. Similar strategies to increase the likelihood of transmission have evolved in multiple genera. Polyenergid oocysts and tissue cysts are found in representatives of the orders Protococcidiorida and Eimeriida. Hypnozoites are found in Karyolysus lacerate and most species of Plasmodium; transovarial transmission of parasites occurs in lifecycles of Karyolysus and Babesia. Horizontal gene transfer appears to have occurred early on in this phylum's evolution with the transfer of a histone H4 lysine 20 (H4K20) modifier, Set8, from an animal host to the ancestor of apicomplexans. A second gene — H3K36 methyltransferase (Ashr3 in plants) — may have also be horizontally transferred. This has rarely been studied at the subclass level. The Haemosporidia are related to the gregarines and the piroplasms and coccidians are sister groups. The Haemosporidia and the Piroplasma appear to be sister clades and are more closely related to the coccidians than to the gregarines. Transposons appear to be rare in this phylum, but have been identified in the genera Ascogregarina and Eimeria. The first Apicomplexa protozoan was seen by Antonie van Leeuwenhoek, who in 1674 saw probably oocysts of Eimeria stiedae in the gall bladder of a rabbit. The first species of the phylum to be described, Gregarina ovata in earwigs intestines, was named by Dufour in 1828. He thought that they were a peculiar group related to the trematodes, at that time included in Vermes. Since then, many more have been identified and named. During 1826–1850, 41 species and six genera of Apicomplexa were named. In 1951–1975, 1873 new species and 83 new genera were added. The older taxon Sporozoa, included in Protozoa, was created by Leuckart in 1879 and adopted by Bütschli in 1880. Through history, it grouped with the current Apicomplexa many unrelated groups. For example, Kudo (1954) included in the Sporozoa species of the Ascetosporea (Rhizaria), Microsporidia (Fungi), Myxozoa (Animalia) and Helicosporidium (Chlorophyta), while Zierdt (1978) included the genus Blastocystis (Stramenopiles). Not all of these groups had spores, but all were parasitic. However, other parasitic or symbiotic unicellular organisms were included too in protozoan groups outside Sporozoa (Flagellata, Ciliophora and Sarcodina), if they had flagella (e.g., many Kinetoplastida, Retortamonadida, Diplomonadida, Trichomonadida, Hypermastigida), cilia (e.g., Balantidium) or pseudopods (e.g., Entamoeba, Acanthamoeba, Naegleria). If they had cell walls, they also could be included in plant kingdom between bacteria or yeasts. Sporozoa is no longer regarded as biologically valid and its use is discouraged, although some authors still use it as a synonym for the Apicomplexa. More recently, other groups were excluded from Apicomplexa, e.g., Perkinsus and Colpodella (now in Protalveolata). The field of classifying Apicomplexa is in flux and classification has changed throughout the years since it was formally named in 1970. Although considerable revision of this phylum has been done (the order Haemosporidia now has 17 genera rather than 9), these numbers seems likely to be still approximately correct. Jacques Euzéby in 1988 created a new class Haemosporidiasina by merging subclass Piroplasmasina and suborder Haemospororina. The division into Achromatorida and Chromatorida, although proposed on morphological grounds, may have a biological basis, as the ability to store haemozoin appears to have evolved only once. The gregarines are, in general, one-host parasites of invertebrates. The adeleorins are one-host parasites of invertebrates or vertebrates, or two-host parasites that alternately infect haematophagous (blood-feeding) invertebrates and the blood of vertebrates. The eimeriorins are a diverse group that includes one host species of invertebrates, two-host species of invertebrates, one-host species of vertebrates and two-host species of vertebrates. The eimeriorins are frequently called the coccidia. This term is often used to include the adeleorins. Haemospororins, often known as the malaria parasites, are two-host Apicomplexa that parasitize blood-feeding dipteran flies and the blood of various tetrapod vertebrates. Piroplasms where all the species included are two-host parasites infecting ticks and vertebrates. Macrogamete and microgamete develop separately. Syzygy does not occur. Ookinete has a conoid. Sporozoites have three walls. Heteroxenous: alternates between vertebrate host (in which merogony occurs) and invertebrate host (in which sporogony occurs). Usually blood parasites, transmitted by blood-sucking insects. The name Protospiromonadida has been proposed for the common ancestor of the Gregarinomorpha and Coccidiomorpha. 1 2 Levine ND (1970). "Taxonomy of the Sporozoa". J Parasitol. 56 (4, Sect. 2, Part 1: Supplement: Proceedings Of the Second International Congress of Parasitology): 208–9. JSTOR 3277701. ↑ Levine ND (May 1971). "Uniform Terminology for the Protozoan Subphylum Apicomplexa". J Eukaryot Microbiol. 18 (2): 352–5. doi:10.1111/j.1550-7408.1971.tb03330.x. ↑ Jadwiga Grabda (1991). Marine fish parasitology: an outline. VCH. p. 8. ISBN 0-89573-823-6. ↑ Saffo M. B.; McCoy A. M.; Rieken C.; Slamovits C. H. (2010). "Nephromyces, a beneficial apicomplexan symbiont in marine animals". Proceedings of the National Academy of Sciences. 107 (37): 16190–16195. doi:10.1073/pnas.1002335107. PMID 20736348. ↑ Stefan H.I. Kappe1; et al. (January 2004). "Apicomplexan gliding motility and host cell invasion: overhauling the motor model". Trends in Parasitology. 20 (1): 13–6. doi:10.1016/j.pt.2003.10.011. PMID 14700584. ↑ Sibley, LDI (Oct 2010). "How apicomplexan parasites move in and out of cells". Curr Opin Biotechnol. 21 (5): 592–8. doi:10.1016/j.copbio.2010.05.009. PMID 20580218. ↑ Norén, Fredrik; Moestrup, Øjvind; Rehnstam-Holm, Ann-Sofi (October 1999). "Parvilucifera infectans norén et moestrup gen. et sp. nov. (perkinsozoa phylum nov.): a parasitic flagellate capable of killing toxic microalgae". European Journal of Protistology. 35 (3): 233–254. doi:10.1016/S0932-4739(99)80001-7. ↑ Duszynski1, Donald W.; Upton, Steve J.; Couch, Lee (2004-02-21). "The Coccidia of the World" (Online database). Department of Biology, University of New Mexico, and Division of Biology, Kansas State University. ↑ Ram, Ev; Naik, R; Ganguli, M; Habib, S (July 2008). "DNA organization by the apicoplast-targeted bacterial histone-like protein of Plasmodium falciparum". Nucleic Acids Research. 36 (15): 5061–73. doi:10.1093/nar/gkn483. PMC 2528193 . PMID 18663012. ↑ Bahl, A.; Brunk, B.; Crabtree, J.; Fraunholz, M. J.; Gajria, B.; Grant, G. R.; Ginsburg, H.; Gupta, D.; Kissinger, J. C.; Labo, P.; Li, L.; Mailman, M. D.; Milgram, A. J.; Pearson, D. S.; Roos, D. S.; Schug, J.; Stoeckert Jr, C. J.; Whetzel, P. (2003). "PlasmoDB: The Plasmodium genome resource. A database integrating experimental and computational data". Nucleic Acids Research. 31 (1): 212–215. doi:10.1093/nar/gkg081. PMC 165528 . PMID 12519984. ↑ Kissinger, J. C.; Gajria, B.; Li, L.; Paulsen, I. T.; Roos, D. S. (2003). "ToxoDB: Accessing the Toxoplasma gondii genome". Nucleic Acids Research. 31 (1): 234–236. doi:10.1093/nar/gkg072. PMC 165519 . PMID 12519989. ↑ Heiges, M.; Wang, H.; Robinson, E.; Aurrecoechea, C.; Gao, X.; Kaluskar, N.; Rhodes, P.; Wang, S.; He, C. Z.; Su, Y.; Miller, J.; Kraemer, E.; Kissinger, J. C. (2006). "CryptoDB: A Cryptosporidium bioinformatics resource update". Nucleic Acids Research. 34 (90001): D419–D422. doi:10.1093/nar/gkj078. PMC 1347441 . PMID 16381902. ↑ Dahl, El; Shock, Jl; Shenai, Br; Gut, J; Derisi, Jl; Rosenthal, Pj (September 2006). "Tetracyclines specifically target the apicoplast of the malaria parasite Plasmodium falciparum" (Free full text). Antimicrobial Agents and Chemotherapy. 50 (9): 3124–31. doi:10.1128/AAC.00394-06. PMC 1563505 . PMID 16940111. 1 2 Kuvardina ON, Leander BS, Aleshin VV, Myl'nikov AP, Keeling PJ, Simdyanov TG (November 2002). "The phylogeny of colpodellids (Alveolata) using small subunit rRNA gene sequences suggests they are the free-living sister group to apicomplexans". J. Eukaryot. Microbiol. 49 (6): 498–504. doi:10.1111/j.1550-7408.2002.tb00235.x. PMID 12503687. ↑ Leander BS, Keeling PJ (August 2003). "Morphostasis in alveolate evolution". Trends Ecol Evol. 18 (8): 395–402. doi:10.1016/S0169-5347(03)00152-6. ↑ Escalante AA, Ayala FJ (June 1995). "Evolutionary origin of Plasmodium and other Apicomplexa based on rRNA genes". Proc. Natl. Acad. Sci. U.S.A. 92 (13): 5793–7. doi:10.1073/pnas.92.13.5793. PMC 41587 . PMID 7597031. ↑ Kishore SP, Stiller JW, Deitsch KW (2013). "Horizontal gene transfer of epigenetic machinery and evolution of parasitism in the malaria parasite Plasmodium falciparum and other apicomplexans". BMC Evol. Biol. 13: 37. doi:10.1186/1471-2148-13-37. PMC 3598677 . PMID 23398820. ↑ Morrison DA (August 2009). "Evolution of the Apicomplexa: where are we now?". Trends Parasitol. 25 (8): 375–82. doi:10.1016/j.pt.2009.05.010. PMID 19635681. 1 2 Templeton TJ, Enomoto S, Chen WJ, et al. (February 2010). "A genome-sequence survey for Ascogregarina taiwanensis supports evolutionary affiliation but metabolic diversity between a Gregarine and Cryptosporidium". Mol. Biol. Evol. 27 (2): 235–48. doi:10.1093/molbev/msp226. PMC 2877549 . PMID 19778951. 1 2 3 4 Levine N. D. (1988b). "Progress in taxonomy of the Apicomplexan protozoa". The Journal of Protozoology. 35 (4): 518–520. doi:10.1111/j.1550-7408.1988.tb04141.x. ↑ Leuckart, R. (1879). Die menschlichen Parasiten. 2nd ed., Vol. 1., Winter: Leipzig, . ↑ Bütschli, O. (1880-82). Dr. H.G. Bronn's Klassen und Ordnungen des Thier-Reichs. Erster Band: Protozoa. Abt. I, Sarkodina und Sporozoa, . ↑ Perez-Cordon, G. et al. Finding of Blastocystis sp. in bivalves of the genus Donax. Rev. peru biol. 2007, vol. 14, n.2, pp. 301-302. ↑ "Introduction to the Apicomplexa". Archived from the original on 20 April 2009. Retrieved 2009-05-31. ↑ Levine, N. D. (1988a). The protozoan phylum Apicomplexa. CRC Press, Boca Raton, Florida, 2 vols., 357 pp. ↑ Euzéby, J. (1988). Apicomplexa, 2: Hémosporidioses, Fascicule 1: Plasmodiidés, Haemoproteidés "Piroplasmes" (caractères généraux). Protozoologie Médicale Comparée. 3. Fondation Marcel Merieux. ISBN 2901773737. OCLC 463445910. ↑ Martinsen ES, Perkins SL, Schall JJ (April 2008). "A three-genome phylogeny of malaria parasites (Plasmodium and closely related genera): evolution of life-history traits and host switches". Mol. Phylogenet. Evol. 47 (1): 261–73. doi:10.1016/j.ympev.2007.11.012. PMID 18248741. ↑ Roberts, L.; Janovy, J. (1996). Foundations of Parasitology (5th ed.). Dubuque IA: Wm. C. Brown. ISBN 0697260712. OCLC 33439613. ↑ Perkins FO, Barta JR, Clopton RE, Peirce MA, Upton SJ (2000). "Phylum Apicomplexa". In Lee JJ, Leedale GF, Bradbury P. An Illustrated guide to the Protozoa : organisms traditionally referred to as protozoa, or newly discovered groups. 1 (2nd ed.). Society of Protozoologists. pp. 190–369. ISBN 1891276220. OCLC 704052757. ↑ Krylov MV (1992). "[The origin of heteroxeny in Sporozoa]". Parazitologia (in Russian). 26 (5): 361–8. PMID 1297964. Brands, S.J. (2000). "The Taxonomicon & Systema Naturae" (Website database). Taxon: Genus Cryptosporidium. Universal Taxonomic Services, Amsterdam, The Netherlands. Roos, David. "Biology of Apicomplexan Parasites". iBioSeminars: Microbiology. iBiology. "Apicomplexa". NCBI Taxonomy Browser. 5794.